I know a lot of people poke fun at The Slanket and its various, inferior impostors. I also know that if you make fun of it, it’s because you haven’t tried it. No, it’s not just a blanket-with-sleeves or a backwards-robe. It is luxurious, comfortable goodness. It’s simple, it’s practical, and it’s pretty much necessary for someone like me, since I don’t think I produce my own body heat. I use it when watching tv, knitting or crocheting, when sending mean looks to my husband for keeping the apartment chilly even though it’s already spring, and reading. That alone makes it worth its weight in gold. I used to hate how cold my arms and hands got when reading, but the Slanket fixed that problem. The Slanket is super snuggly and high quality. It doesn’t pill, it’s very plush, and it’s gigantic. At 60″ by 95″, it covers pretty much my whole queen sized bed. There are many colors and patterns. They also come in kid size, travels size, and a Siamese version with four sleeves for cuddling. I love my Slanket (and my older cat loves to snuggle in it, too), but I also love the Slanket company and the charity work they do. All blue Slankets raise money for H2O AFRICA. Green, brown, and grey Slankets help contribute to the NATURAL RESOURCES DEFENSE COUNCIL. The lavender, ruby wine, and apricot accumulate funds for the BREAST CANCER RESEARCH FOUNDATION. 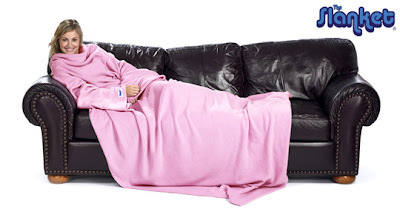 Buy a Slanket, get cozy, and help raise money for charity. I think they are a love/hate thing. But for those of us that get cold, they are a godsend!